Metrics Drupal 8 is a stunning, professional and flexible SEO & Marketing Business specially designed for Digital Marketing Agencies, SEO companies, Social Media specialists and Marketers, corporate and accountancy businesses. Weíve designed specific demo corporate marketing pages ready for you to use and launch your new marketing website with easily. 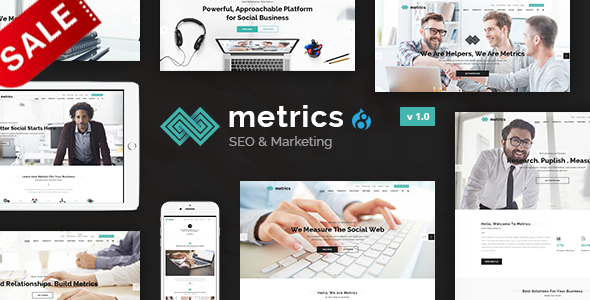 Metrics Drupal 8 Theme comes with necessary features and pages for SEO & Marketing websites such as About, Services, Testimonials, Clients, FAQ, Gallery, Products, Solutions, Marketers & Single Marketer Profiles, Awesome Blog/News pages, Questions & Answers and +170 awesome blocks and options. This HTML template can easily satisfy all of your needs.